As often as you like during your turn (before your attack), you may attach 1 [W] Energy card to 1 of your [W] Pokémon. (This doesn’t use up your 1 Energy card attachment for the turn.) 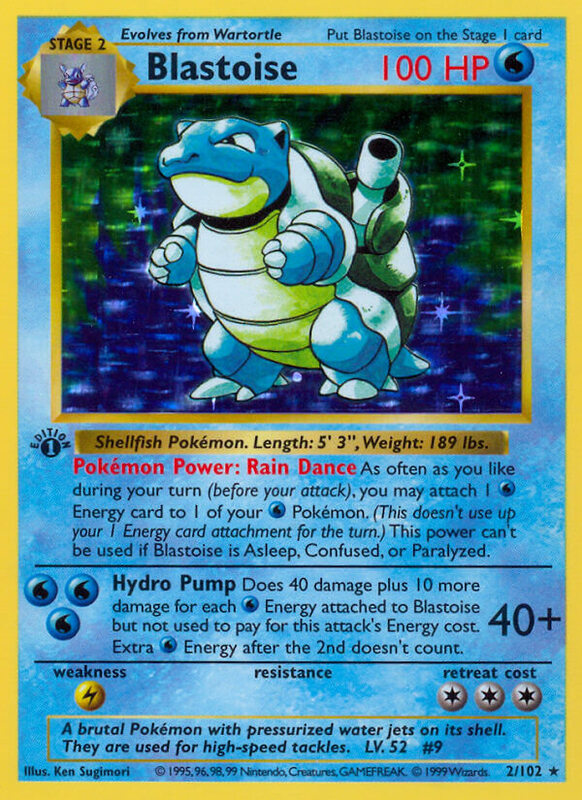 This power can’t be used if Blastoise is Asleep, Confused, or Paralyzed. Does 40 damage plus 10 more damage for each [W] Energy attached to Blastoise but not used to pay for this attack’s Energy cost. Extra [W] Energy after the 2nd doesn’t count. A brutal Pokémon with pressurized water jets on its shell. They are used for high-speed tackles.